As previously noted, I recently purchased a 2012 Triumph Thruxton 900. It had only 137 miles on it and the original Metzeler tires. I noticed right away in riding it that the tires do not grip and handle as well as the Dunlop GT 501’s on my 2008 Bonneville. Unfortunately the GT 501’s are being discontinued by Dunlop, and finding a set for the Thruxton would be difficult. So, I went back online to see if there was a recommended alternative. 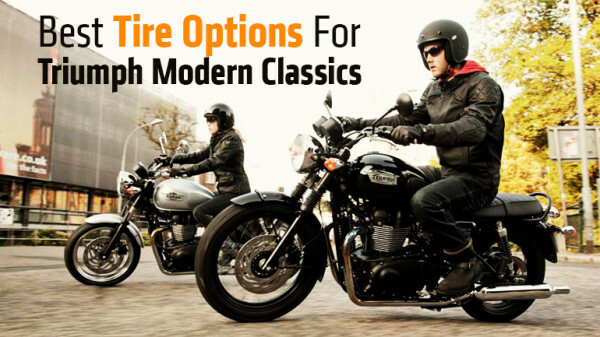 I found this article by Jacob Moss on the RideApart website with tire recommendations for the Triumph Bonneville Modern Classics. In it he reports the recommendations of Adrian Packett, owner of Canyon Motorcycles. Based on this article, I decided to try the recommended Dunlop Roadsmart II for performance. I ordered the tires through Amazon for a reasonable price = $119 for the front and $125 for the rear. 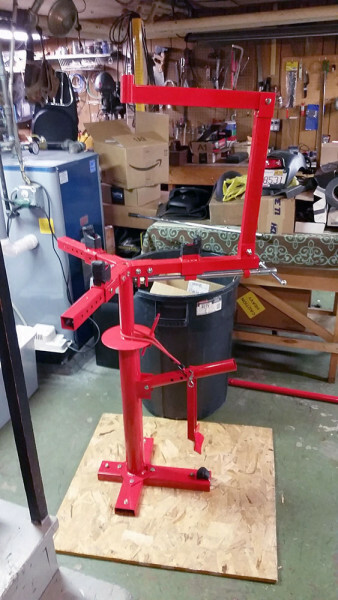 I also ordered a tire changing tool and motorcycle attachment from Harbor Freight Tools. Here are a couple handy videos on how to use this tool, and modify and improve it. 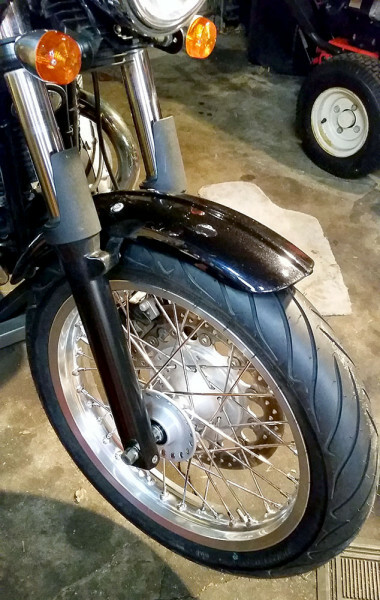 Today I was able to mount the rear Dunlop Roadsmart II tire (150/70-17) on my Thruxton. Dunlop Roadsmart II rear tire mounted on stock Thruxton wheel. The 150/70-17 size is noticeably wider than the stock 130’s. I like the look better than the stock size, and it fits fine on the stock rim size and inside the frame. 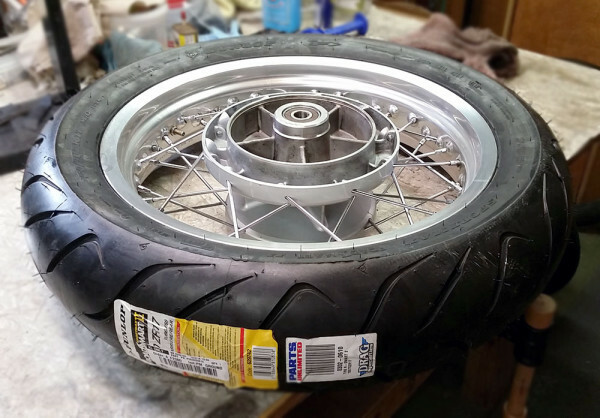 In a few weeks I will report on my experience comparing these tires with the original Metzeler’s and my experience with the Dunlop GT 501’s. 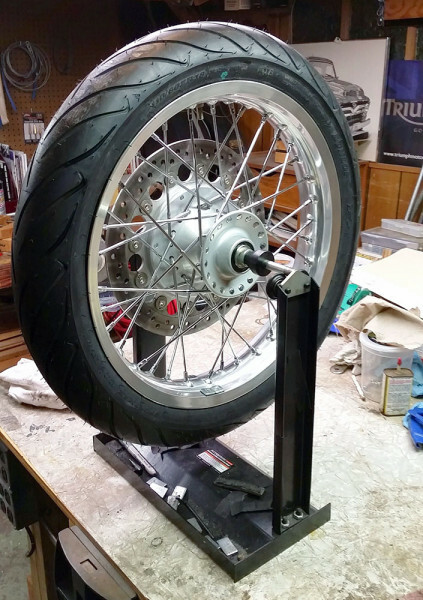 It’s been several weeks since I completed the mounting and balancing of the Dunlop Roadsmart II’s on my stock Triumph Thruxton wheels. Although the weather in Chicago has been spotty for motorcycles, I have been able to put on a couple hundred miles. My impression is that these grip the roads around Chicago better than the OEM Metzeler’s and there is less side-to-side slipping on wet or damp roads. The tires are smooth and quiet at higher speeds and I feel confident with them. Keep up the good work! I always enjoy reading/watching your posts; as well as the progress with your bike(s). Hey, thanks for the comment… much appreciated! Are you still riding up there in BC? I’m really curious to get your impression when you get your engine back after being bored out. I was thinking of doing the same, however with the info you have regarding the new bikes for 2016, perhaps I will wait for one of those??? Yeah the cam cover leak is pretty common. The outer gasket is not hard, it’s the 4 additional gaskets around the 4 bolts that hold it on that are trickier. I have a buddy who did the front progressive spring swap and his went well. He did not have to take the forks off the bike, just did everything from the top. The Haynes manual helps with a lot of info, but it doesn’t always help with new mods that are aftermarket products. You will need to rely on the manufacturer for recommendations, for instance on the Progressive springs. They should tell you if you need to change the fork oil or what level the oil should be at, etc. The engine comes off my Bonneville tomorrow and I hope to build the crate and ship it out to Bonneville Performance within the week. I have been enjoying your site since I discovered it about a year ago. I also have a Thruxton, a 2014 model, and I will be changing out the tires this spring. I was very interested in your post about the fitment of the Dunlops and hope to hear- rather, read your thoughts on these, particularly the size change on the rear- was the 150 easily mounted on the stock rim for instance. Thanks, and keep us updated on your projects, it’s a great read. Thanks for your comment and for following the blog! I had a chance to put about 40 miles on the new Dunlop Roadsmart II’s today, and they felt good. They are stickier than the Metzelers, so I felt more confident on the road. It is was near freezing here in Chicago, with dry road conditions. 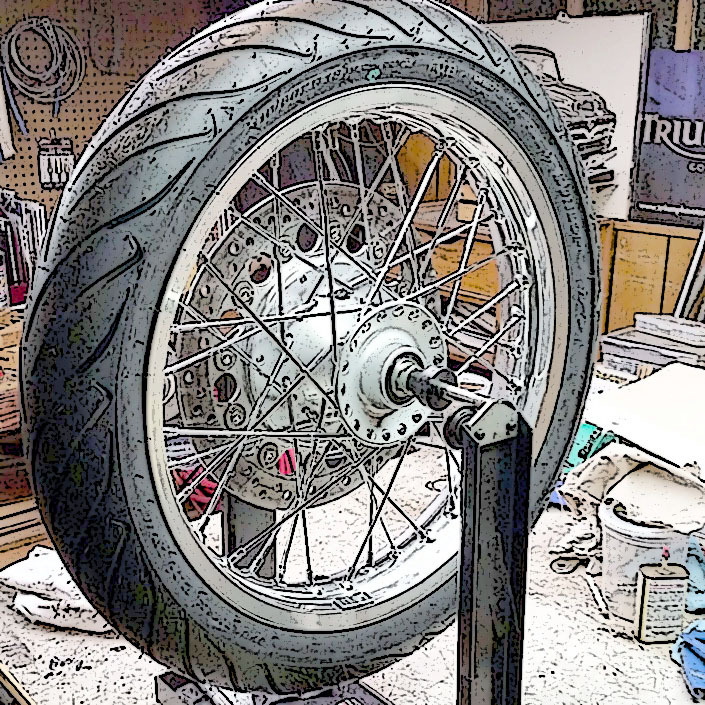 I like the look of the beefier rear tire as it fills the frame out better than the stock size. 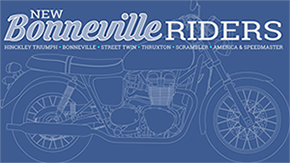 I’ve been using 150’s on my Bonneville for over a year… with no problems at all. 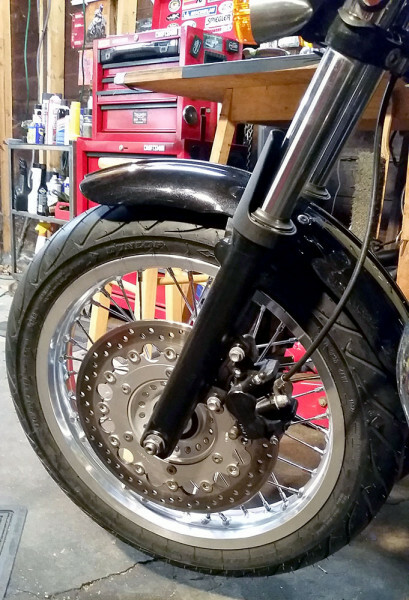 To follow up on your comment, “I’ve been using 150’s on my Bonneville for over a year… with no problems at all”…..was that size on your stock or upgraded rims? …and are your upgraded rims the same size as stock? Yes, my upgraded rims are stock size and I am still running the same Dunlop GT501 tires and sizes on the Bonneville! On the Thruxton I am using the Roadsmart II’s because the 501’s are so hard to find. Give either a try… I think you’ll like them! I wanted to upgrade and increase the tire size on my 2005 Bonneville as well. I have been running into ‘reluctance’ from my local Triumph dealer regarding changing the size. I agree that the larger size would look better. Can you confirm the size for your Bonnie that you have referred to with using the stock spoke rims. I have seen some custom bike online with Fr. 110/80 and Rear 140/80 that I was trying to emulate but they may have upgraded the rims. After using these tyres for more than a month what is you feedback on the same. Also, asphalt in India is much coarse and a lot of loose gravels would you suggest these tyres for here? it seems that they mount well on the original rims… I looked at the recommended rim size the front seems OK as 2.75 is the recommended but 2.5 the original is allowable. The back recommendation is 4.25… The stock is 3.5…. Do you feel the the profile is pinched ?… I am very eager to hear your feedback on the riding impression.. I have the Avon am26 roadrider at the moment but I want to also move to the roadsmart 2. I still like these tires after several thousand miles on them. I have not noticed any problems with the larger tire on the rear rim, in fact not only does it looks better, it rides and corners very well. Thanks for following this blog and for your comments. 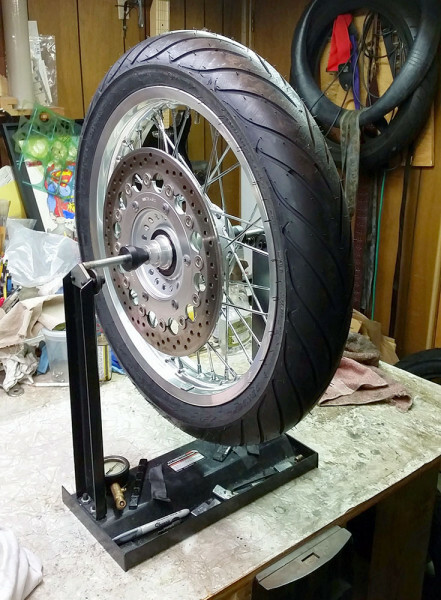 I was able to mount and balance the Dunlop Roadmasters on my stock Thruxton rims with no trouble. I do this by manually with tire irons and hand tools. I have a couple hundred miles on them now, and they are much better than the OEM Metzelers. I have not noticed as much side to side “slipping” as when I had the Metzelers on. So, my impression is that these are a good replacement for the Dunlop GT501’s that I loved so much (and are no longer available). I noticed that in the title you use the term roadmaster but later in the text body roadsmart. Can you confirm that the referred to tyres are indeed “roadsmart II”. Thanks for the catch, I have corrected the Title… they are in fact the Dunlop Roadsmart II tires. what size front tire are you using? I was wondereing the same. I see that Dunlop do a 110/80 for the 19inch T100 front wheel and couldn’t see a 100mm wide tyre and can only presume it’s the 110mm size. But I may be wrong! On the Thruxton I am using a 110/80ZR-18 front tire. Great post! It looks like you had the tubeless Roadsmart on a spoked wheel? I thought those needed tubes for the spoke wheel? Thanks for reading the post and for your comment/question. On spoked wheels, yes, you need to use an inner tube as well, which I am using. These tires are designed to be used with or without tubes. I am still running them on my Thruxton and still feel they are among the best tires I have yet tried. Thanks for your comment. Although Dunlop does still list the GT501’s on their website, it is very difficult to find them to purchase in the US. Maybe it is different elsewhere. The places where they are still available are generally listed as “Closeout” items on sale, and generally you find only the front tires available. Do a search on Dunlop GT501 Rear Tire 150/70-17 and you’ll see what I mean. While shopping for these tires a year or so ago, I had suppliers tell me they were being discontinued. If you find an available supply, please let us know! Hey Randy, I was wondering if you had any clearance issues, going with the Dunlop Road Smart II with the following sizes. Thanks in advance for the reply and great job on the posting! Good question! I had no clearance issues at all with these larger sizes on the Thruxton. Here’s a photo that shows the Thrux with these tires on it. Thanks for the quick reply Randy, much appreciated. Bike looks great! Hi guys I rode 16.000 km with my Bonnie here in Australia using the RSmart 2 (sizes 110/80 R19 and 150/70 R17) so impressed about feeling and grip , now is time to change …..so new question what about The roadsmart 3? Thanks guys for share all these interesting info. All of which seem to suggest that the RSIII will outperform the RSII. If I were ready for a new set of tires, I’d give them a try! Hello Randy. Thank you for putting this site together. I’ve learned a lot of things thanks to you sharing your experiences with your Triumphs. I recently installed a new set of tires on my 2015 Thruxton in 110/80 front 150/70 rear and was wondering what you run for tire pressures? I’m looking for a good starting point. Thanks again. Hi Randy .was Just wondering any issue with the weaving a lot of people talk about with the thruxton at high speed ? Thanks.